Divya Chugh Jewellery is distinctive in style. It is intricate yet striking, bold yet feminine. The brand become synonymous with setting high standards for style, quality, detailing, design and elegance. This is a line of limited edition jewels that lets one indulge in the feeling of luxury being affordable to all. Unusual colours combined with exotic precious and semi precious gemstones and pearls set the basis for Divya Chugh’s novel designs and all the pieces are set and crafted using the highest standards in manufacturing techniques thus never compromising on the finish. The jewellery is manufactured in different workshops one in old Delhi while the other in Jaipur jewellery design workshop. And everything is assembled and quality checked in the design studio The Divya Chugh in the Indian Market scenario and is recognized for its quality and craftsmanship. She loves to resign and remodel old and antique jewellery giving them a modern look yet what can be inherited for generations further again . With 13 years of focus and experience in this field, she still feels like a creatively inclined soul who happened to come into Jewellery Designing by chance, only to discover that she was born for it. Trained at the London Institute of Design and the International Gemological Institute, New Delhi, Divya Chugh first launched her eponymous label in 2004. 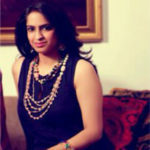 With a unique style and passion for design, Divya has established a name for herself as one of the most sought after jewellery brands in the country with an elite clientele and patrons from all over the world. As a designer, Divya’s personal aesthetic has evolved with both Indian as well as Western overtones, and a constant endeavour to mix different ideas, technology and aesthetic to meet the clients needs. With a combination of traditional Indian designs and modern techniques, ‘Jewellery by Divya Chugh’ has created a distinct design aesthetic, which makes the brand uniquely beautiful – in fashion jewellery as well as high-end precious jewellery. Divya is also a self-taught artist and lives in New Delhi, India.